Inspired by the art deco designs and vivid colours of the David Jones department store cafe in Sydney, 'The Lacquer Room' embodies the modern inter-war urban experience. The rich red and scattered patterns of the chairs are contrasted with the gleaming green of the lacquered tables, set against the brightness of the walls and polished floors. 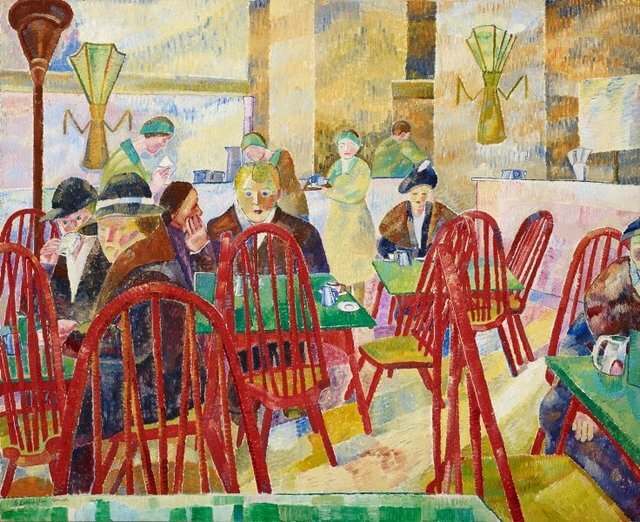 Grace Cossington Smith’s bold approach to colour exudes a sense of celebrating the new, similar to the contemporary consumer culture epitomised by the department store. Signed l.l. corner, black ink "G Cossington Smith". Not dated.